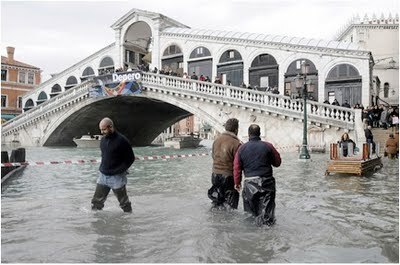 Some of the most emailed pictures of the weekend (per Yahoo News) were those of a flooded, sopping Venice (the worst in 22 years). Despite the unlucky lagoons throughout the city, Italians rang in 2010 drinking champagne, watching fireworks, smiling and all while wearing waders! I think we need to take a lesson from the Italians and lighten up. 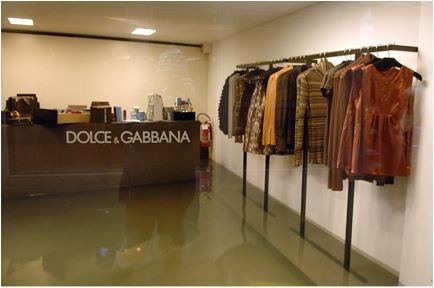 As shown below, the Italians can find happiness in the most dire of circumstances. I visited Venice a while back and was taken with the city. Yes, it was a tourist trap, but we were blessed to get to experience some of the truly Venetian sites and situations that many don’t see. I highly recommend visiting Venice once in your life. 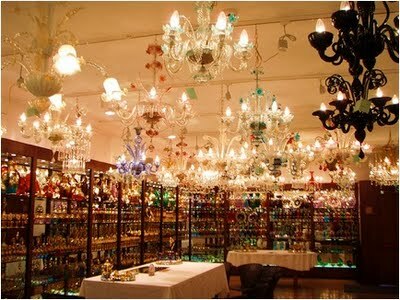 If not to take a ride on an authentic gondola (try riding one in Vegas after going here), then to visit the Murano factory and acquire a fantasy chandelier to hang above you dining room table like a crown-jewel (the only thing drawing attention away from it is your witty dinner party conversation). Since Venice is front and center in the news, I wanted to share with you an amazing cocktail, The Bellini, born in Harry’s, Bar one of the most famous restaurants in all of Europe. 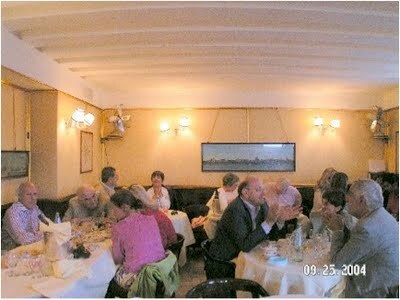 I think our entire dining experience at Harry’s was surreal too, because it was during the Venice film festival and the rest of the upstairs of the small restaurant (where we were sitting) was taken over by John Travolta and posse! Memories! The Bellini is girlie (yet macho enough for Travolta), easy on the calories, but ooohh so tasty with vegetables and a little pasta al dente. Created sometime in the thirties by Giuseppe Cipriani, he christened his white peach cocktail “the Bellini” (after Giovanni Bellini, the fifteenth century Venetian painter) in 1948. Made with Prosecco instead of Champagne, it is nevertheless widely regarded as the best Champagne cocktail in the world. When making a Bellini, everything (the glasses, Prosecco and white peach puree) should be as cold as possible. 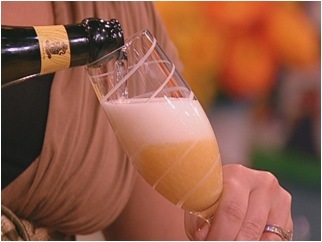 The general rule is to use one part white peach puree to three parts Prosecco. Use fresh frozen white peach puree when you can, but when making your own puree, never use a food processor because it aerates the fruit. (the bartenders at Harry’s often use a cheese shredder, shredding the peaches and using a strainer to collect the maximum amount of juice.) Add a bit of sugar or some simple syrup if the puree is too tart or a tad sour. To make simple syrup for the Bellini, combine the sugar and water in a small saucepan. Bring to a boil and simmer until the sugar has completely dissolved. Remove from the heat and allow to cool completely. You can make the simple syrup days in advance. Place the peaches in a blender carafe with 1/4 cup of the simple syrup mixture. Puree until completely smooth. To serve, pour the puree about a quarter of the way up a champagne glass and top it off with sparkling white wine and garnish with a sprig of mint. 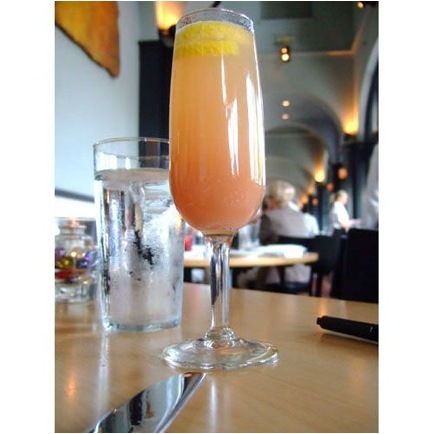 Have you ever tasted a Bellini? Do you have a certain cocktail that takes you back to a fabulous moment in your life? I’d love to hear and remember to keep counting. 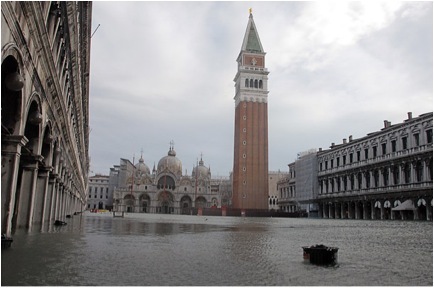 The photos and mention of Venice underwater took my heart for a dive. It saddens me to know that the most beautiful of churches (and clothing, ha!) could be ruined by this flood. Some of the best memories of my life came from this very city (and Firenze) while on a study abroad trip during college. It is in Italy that I had my first wine tasting class, smelled the sweet aroma of pasta cooking at 6am while walking home from dancing the night away, and experiencing 'The Pieta' at the Vatican. Just writing about this makes me want to go back! !